Ecclesiastical heraldry naturally divides itself into various branches, principally: the arms of religious corporations, and other bodies; the insignia of ecclesiastical dignity, rank, or office; the charges, terms, and forms of general heraldry having a religious or ecclesiastical origin, usage, or character; the emblems or devices attributed to or typifying particular saints or other beings venerated by the Church. Intermingled with all these categories is their symbolism, real, suggested, or imaginary; and deeply interwoven, more especially in relation to the insignia of ecclesiastical rank, lies the consideration of ecclesiastical vestments. The origin of heraldry itself is still shrouded in much mystery. It is really a development and conjunction of three ideas, none of which alone can be regarded as heraldry. First came the mere personal device or emblem indicative of the individual, an idea traceable through the standards of the children of Israel, through the devices of the Romans, the Greeks, and the Egyptians, attributed both to real and mythical personages, and through the totems of the savage. Next came the decorative idea of the indication of ownership evolving itself in one direction into the authentication of the seal by its device. Lastly came the military necessity of proclaiming identity when armour rendered ready recognition difficult; and imposed upon the combination of these ideas was evolved the heredity or continuity of these emblems, by which time heraldry was a perfected and (for the necessities of the period) a completed science, used everywhere upon seals, banners, shields, and surcoats. It is universally admitted that armory, as we now understand the term, did not exist at the time of the Norman conquest of England. By the end of the twelfth century it had become general throughout England, France, Italy, and Germany, and no doubt it was due to the common meeting-ground of the Christian nations at and during the Crusades that the fundamental principles of the science of heraldry are and have always been cosmopolitan. There is no hard and fast dividing line between heraldry in general and ecclesiastical heraldry  each has the same origin, the same lines of coeval development  but the application of heraldry to ecclesiastical purposes first occurs in the appearance of armorial bearings of a personal and family nature on ecclesiastical seals, and of sacred or saintly devices upon vestments and ecclesiastical banners. The latter influence is of less importance because it was more ephemeral and more in the nature of pure symbolism than of armory. The earliest ecclesiastical seals  nearly all, in early times, vesica-shaped, as they have continued to the present day  bore the bust, half-length or full effigy of the owner of the seal. So, at that period, did the seals of non-ecclesiastics upon which are the mounted effigies of knight and noble with (as they developed) the armorial shield and bardings fully displayed. Then we get, from about 1300, the seal showing no more than the shield of arms, and concurrently the ecclesiastical seal progressed through the canopied effigy with the shield of arms in the base to the later form with heraldic achievement and legend alone. Ecclesiastical heraldry simply progressed coevally and upon the same lines as heraldry in general. The earliest ecclesiastical seals were unquestionably purely personal, bearing the effigy, arms, or device of bishop or abbot respectively, as the case might be, but, in England at any rate, the "Statutum de apportis religiosorum" of 1307 (35 Edward I) enacted that every religious house should have a common seal, and that all grants made to which this common seal was not affixed should be null and void. With the common seal of a community came the idea of an impersonal coat of arms for that community, but as there is no definite date at which such common seals became armorial so there is no common origin from which the devices were drawn. It has been a matter of keen controversy in England at what date control was effectively exercised by the sovereign authority in matters armorial. It can be definitely carried back to the beginning of the fourteenth century; but in matters of religion the appeal was to Rome and not to the temporal sovereign, and there is little, if indeed any, evidence of a regularized control of ecclesiastical heraldry before the date of the Reformation. For this reason the arms of abbeys and priories have little of the exactitude that characterizes other heraldry of the period, and we find that in England, as in all other countries, the personal arms of donors, benefactors, or predecessors in office were constantly impressed into service for the purpose of impersonal arms of a community. In some cases (e.g., in the case of the arms of the See of Hereford) even these personal arms became stereotyped by repetition of usage into the impersonal arms of the office or community, though of course many, perhaps the majority, from the character of the charges and devices which make up the coat of arms, are obviously designed for, and indicative of, the purpose they serve and the community for which they may stand. A large number of ecclesiastical, as of other public, coats of arms, are based upon the figures and effigies of patron saints originally used and represented as such and without heraldic intention. The natural consequence is that in many cases of religious communities there are two or more entirely different coats of arms doing duty indifferently. Impersonal arms of this character were borne for the sees, episcopal and archiepiscopal, and for the abbeys and priories, and for the religious orders. These arms, regarded merely as coats of arms in all matters of heraldic rule and blazon, conform to the ordinary rules and laws of general armoury so far as these may concern them; nor in character do they in any way differ therefrom, save in matters of external ornament. One point, however, may be alluded to here. The shield is the ordinary vehicle of a coat of arms. It is obviously and essentially a military instrument, and the supposedly peace-loving ecclesiastic has often preferred to substitute for the shield the oval cartouche (Figure 1). In some countries, notably Italy, Spain, and France, the use of the cartouche for ecclesiastical purposes has been very general, but with the recognition of this ecclesiastical preference for the cartouche, it should not be overlooked that the laity have also made occasional use of it for purely personal armory and that the usage of the shield for ecclesiastics is too universally general at all periods for any suggestion of impropriety to follow its use in preference to the cartouche. Although England is a Protestant country, and her post-Reformation ecclesiastical heraldry is devoid of any subsequent Roman developments, nevertheless the official control of armory in that country has been and has remained more efficient and effective than the control in any other country, and when in England the temporal power assumed the headship of the Anglican Church, and in consequence the control of her heraldry, the armorial practice existing at that date was stereotyped and has since remained unaltered. For that reason the English law concerning episcopal arms may well be considered as indicative of the reality at a period when heraldry was of greater importance than at present. For this same technical reason the English Crown declines to grant arms of office for any of the sees established in the United Kingdom by the Holy See, although request therefor with a tender of the proper fees has been made on several occasions. The result is that Catholic bishops in England, as in some other countries, use only personal arms with their exterior insignia of rank. In the case of the archiepiscopal See of Westminster arms were granted by papal Brief, but this is a solitary instance, and no official recognition of them has been made by the temporal authorities. In the registration of the personal arms of His Eminence the late Cardinal Vaughan, in the College of Arms in London, and in the matriculation of the personal arms of the Rt. Rev. Æneas Chisholm, Bishop of Aberdeen, no objection was made to the registration of the red hat of the cardinal and the green hat of the bishop. 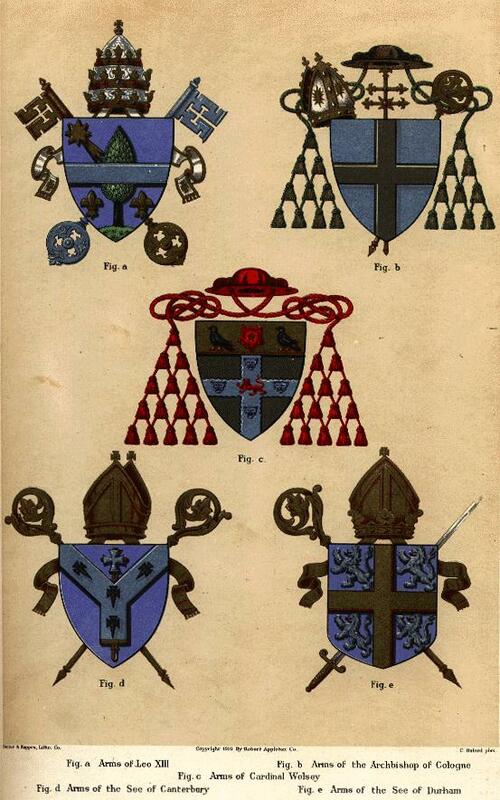 As examples of official ecclesiastical arms, Figure 2 represents the arms of the Anglican See of Hereford; (Plate I, Figure B), the arms of the Archbishopric of Cologne, and Figure 3 the arms of the Abbey of Melk. These official arms, in the earliest cases borne upon a separate shield from the personal arms, are now at the pleasure of the individual borne alone or marshalled with his personal arms upon a single shield. In England it has always been customary when marshalling official with personal arms to do so by impalement and in no other manner, the official arms taking the precedence on the dexter side (Figure 4). A curious consequence of the English Reformation with its abolition of the necessity of celibacy is to be found in the marshalling of the arms of a married (Anglican) bishop. This is never done upon a single shield. Two are used placed accollé. On the dexter shield the official arms of the see are impaled with the personal arms of the bishop and on the sinister shield these personal arms are impaled with those of the wife (Figure 5). In Italy most of the sees have official arms, but these are not often made use of, but when they are used they frequently occupy the upper, or "chief", portion of a shield divided per fesse. In Germany the official and personal arms, though sometimes marshalled by impalement, are usually quartered, the official coat being placed in the first and fourth quarters. Where several sees are united in one person the various official arms are quartered, and the personal arms are placed en surtout; but on the contrary, where the personal arms consist of a quartered coat the official arms will sometimes be found en surtout, which illustrates a diversity of practice to which the English rigid exactitude of rule would seem preferable. In France the ecclesiastical peers (the Archbishop-Duke of Reims, the Bishop-Dukes of Laon and Langres, and the Bishop-Counts of Beauvais, Châlons, and Noyons) all had official arms which they sometimes quartered and sometimes impaled with their personal arms. Strictly speaking there are no official arms for the papal sovereignty. Although the crossed keys of St. Peter displayed upon an azure field, have occasionally been used for that purpose, and with such intention, they are more properly a device in the nature of external ornaments to the shield, and as such will be again referred to later. In relation to the use of personal arms, although in England the ordinary rule and practice were usually observed, elsewhere an ecclesiastic seldom made use of any marks of cadency. Even marks of bastardy are found to have been discarded. The reason is simply that, ecclesiastics being celibate, there would be no descendants to claim pedigree whom it would be necessary to place correctly in a family, whilst for the individual concerned his ecclesiastical ornaments of rank were sufficient distinction. But the omission of cadency marks does not appear to have been a matter of universally accepted rule. The chief distinction in the bearing of personal arms by an ecclesiastic is found in the use of the mitre, the crosier, and the ecclesiastical hat. Though there are a few examples which might be mentioned of the use of the biretta, both scarlet and black, these may be regarded as merely freaks based upon personal inclination. The heraldic use of the ecclesiastical hat undoubtedly originates in the red hat of the cardinal, which, as a vestment, dates from 1245. The sending of the actual hat was of course a matter of ceremony and of importance, and for that reason the armorial use of the hat as indicative of the rank was a foregone conclusion. Its heraldic use dates from the early part of the fourteenth century. There is abundant evidence in England of this heraldic use before the Reformation, but the writer is unaware of a single instance in which any other ecclesiastical hat than that of a cardinal was ever employed heraldically. This would seem to show, as was indeed the fact, that the extended use of the ecclesiastical hat was a subsequent development even in Italy and France, though it must be admitted that in Spain the green hat of bishops and archbishops had had some usage since 1400, a practice which grew in that country, where it was an alternative, and preferred to the use elsewhere of the cross and mitre. In the seventeenth century the use of the ecclesiastical hat for the lower ranks of the Church became, as it has since remained, fairly universal. The ecclesiastical hat is low, flat, wide-brimmed and depending from either side are cords and tassels. Though usually referred to as tassels, they are sometimes termed houppes or fiocci. Originally the number of tassels was indeterminate, the natural consequence of the exclusive use of the hat by cardinals; there are even examples to be found in which no tassels are shown, the strings of the hat being simply knotted. But in early representations six tassels on either side are most usually to be found, these being arranged in three rows containing one, two, and three tassels respectively. In later times, with the extension of the use of the ecclesiastical hat, differentiation was made both in the colour and in the number of the tassels, but in attempting to make use of such differentiation it should be remembered that even after an established rule and usage had come into being adhesion thereto was far from being universal. In the Catholic clergy and in the Anglican as well (where many of the archbishops have preferred and assumed the coroneted mitre of the Bishop of Durham) there seems to have been a constant desire to appropriate more than belonged to them of right. In the armorial display made by ecclesiastics there is a far greater amount of bogus and incorrect heraldry than is to be met with elsewhere. The assumption of personal arms by those of plebeian birth and the invention of arms of office where none have been assigned by any competent authority, bring armory into grave disrepute, and its study into hopeless confusion. Some excuse may be urged in mitigation in America and other republican countries which do not officially countenance the granting and creation of arms, which is admittedly an attribute of sovereignty, but there is no such excuse as to personal arms in monarchical countries, as the religious sovereignty of the papacy is universal and surely sufficient to apply what may be lacking in matters which are purely ecclesiastical. But to this unfortunate habit of the ecclesiastical mind is due the fact that in a very large number of cases it will be found that, whatever the rank, one more row of tassels has been added than should be the case. The rules which follow are those which are recognized in Rome, and in recent years there has been a healthy reversion in many cases to the proper procedure in matters heraldic. The cardinal's hat is scarlet and has on either side fifteen tassels arranged in five rows of one, two, three, four, and five tassels respectively (Plate I, Figure C and Plate II, Figure C). The green hat is employed by patriarchs, archbishops, bishops, and archabbots. The patriarch has fifteen tassels, as a cardinal, but the cords and tassels of a patriarch's hat are interwoven with gold (S. Congr. Cærem., 3 Nov., 1826). An archbishop has ten tassels arranged in four rows of one, two, three, and four respectively (Plate I, Figure B). A bishop (Plate II, Figure D) has six tassels on each side arranged in three rows of one, two, and three respectively. But as far back as the seventeenth century bishops were using ten tassels, and a hat with that number appears in the matriculation of the arms of the Bishop of Aberdeen previously referred to. Archabbots possess episcopal rank and use the same hat as a bishop. Generals of orders are assigned six tassels. Three tassels are assigned to provosts, mitred abbots, and provincial superiors of orders (Plate II, Figure E). Two tassels are assigned to local superiors (prior guardian, and rector). The ordinary ecclesiastical hat of the simple priest is black, but of the same shape, and had originally on either side a single tassel of the same colour (Figure 6) but following upon the ecclesiastical habit of taking the next higher emblem than was proper the single tassel later developed into a double one (Figure 7). This practice has been followed so widely that one almost hesitates to say it is wrong, and there has been a subsequent unauthorized progression to three tassels arranged in two rows of one and two on either side. Nevertheless, the rules for the black hat which are recognized in Rome assign a single tassel to the simple priest. The General of the Order of the Premonstratensians (White Canons) uses a white hat with six white tassels. The prelates of the papal chamber use a violet hat with ten red tassels on either side. Apostolic prothonotaries are entitled to a violet hat with six red tassels at each side. Domestic prelates, privy chamberlains, and privy chaplains of His Holiness have a violet hat with six violet tassels. Honourary chamberlains and chaplains have the violet hat, but only three violet tassels. The heraldic mitre is placed above the arms of all persons who in the Catholic, Eastern, Anglican, or Episcopalian Churches are in theory or fact entitled to wear the mitre. Archbishops and bishops use it. Most abbots use it and did in England before the Reformation, though some abbots are not mitred abbots and have therefore no justification for its display. The mitre as a vestment, of course long antedates the existence of heraldry, and in fact exists in three forms, termed respectively pretiosa, auriferata and simplex. The auriferata (which is made of cloth of gold or of thin gold plates, and is not jewelled) is the one always used in English heraldry for an Anglican bishop or archbishop. The shape of the heraldic mitre has varied somewhat according to the varying styles of heraldic art in vogue, and there is at present a tendency to revert to the ancient wider and lower shape in armorial representations. It is always represented as of gold, and the lappets or infulæ depending from within it are of the same colour (Figure 8). It has been asserted that in pre-Reformation usage a distinction was drawn between the mitre of a bishop and an abbot by the omission in the case of the latter of the infulæ. Certainly, in England and France it was usual, for heraldic purposes, to place the mitre of an abbot slightly in profile. In most continental countries it has been more usual to represent the mitre of white ornamented with gold, no doubt an attempt to represent the pretiosa mitre, which, though heavily jewelled, is really on a foundation of gold. The representation of the simplex mitre cannot be intended, as this is really of plain white linen. In spite of many statements to the contrary, the mitre (in fact and heraldically) of bishop and an archbishop are identical. The coroneted mitre (Figure 9), which has so often been used by archbishops under the belief that it appertained to archiepiscopal rank, is really and exclusively the mitre of the Bishop of Durham. The See of Durham, until early in the nineteenth century, was in fact and law also a temporal palatinate, and, though latterly its attributes of temporal sovereignty had declined, anciently the temporal power was of wide extent, the Bishops of Durham having their own separate parliament. In token of the temporal power the bishop had his coronet, in token of his spiritual power he had his mitre. Alone amongst the English bishops, his arms were surmounted by a helmet [they so appear in the famous "Armorial de Gelre" (Figure 10) where the helmet, with its mantling, is shown with the small shield tilted in the fashion of early heraldic displays], and on his helmet was placed his coronet. Within the coronet was his mitre and the representation of the two together led to the appearance of the coronet as the rim of the mitre, and coronet and mitre have been armorially depicted together. But no evidence of the wearing or actual existence of a coroneted mitre is known, and the present form is the heraldic conjunction of a coronet and a mitre. Whether since the abolition of the palatinate the right to the coronet still remains, is open to argument, but officially its use is still sanctioned. The crosier, which is another external ornament to the shield widely made use of by ecclesiastics, must not be confounded, as it often has been, with the processional cross of an archbishop. Nor is the name, crosier, a confusion of terms. The crosier is, as it has always been, the pastoral staff. Originally nothing more than a staff used for assistance in walking, it has been conjectured that its ceremonial use and ecclesiastical status is a consequence of its convenience to aged prelates as an assistance and support during lengthy services. The crosier as a sign of episcopal dignity is said to be traceable to the fourth century and to have been used by abbots in the fifth. In its early form it was surmounted only by a boss or a simple bend, and in the Eastern Churches the crosier terminates not in a crook but in a tau, the ordinary form of a crutch. This, however, has now developed into an elaborated form, much as if the crook of the Western crosiers were duplicated at the other side of the staff (Figure 11). The development of this crook is merely artistic and decorative the symbolism of the shepherd's crook has been invoked. In this, as in all other matters of symbolism, it is exceedingly difficult to determine whether the form followed the symbolism or whether this is a later attribution. Certain it is, however, that there is a widespread belief that, whilst the crook in the case of an abbot should terminate inwards (Figure 12), that of a bishop should terminate outwards (Figure 13), the suggested symbolism being that, whilst the jurisdiction of an abbot was strictly confined to his abbey, that of a bishop was not so restricted. The same symbolism has been read into a heraldic practice, which undoubtedly has much acceptance, by which the crosier of an abbot placed in bend sinister behind the shield was represented with the crook turned inwards towards the mitre (Figure 3) whereas the contrary position was adopted for the crosier of a bishop (e.g., Figure 2). But no such distinctions appear ever to have been recognized in relation to the actual crosiers carried by bishops or abbots. The sudarium or veil, which really has no symbolism, and is attached to the crosier for mere purposes of cleanliness, is sometimes met with in armorial representations (Figure 13). In England, in the Anglican Church, two crosiers are placed in saltire behind the shield of a bishop or archbishop (Figure 2, Figure 5, and Plate I, Figure D). Woodward questions the propriety of this fully established practice, unless in a case of a double episcopate, but that writer has apparently overlooked the fact that, whereas in other countries a crosier, e.g., is represented singly in bend, or most frequently in bend sinister. It has been the invariable custom in England to duplicate insignia of this character and place them in saltire behind the shield, e.g. the batons of the Earl Marshal or of Lyon King of Arms. The Bishop of Durham alone amongst the Anglican bishops substitutes a naked sword (indicative of the temporal palatinate of Durham) for one of the crosiers. The seal of Bishop Gilbert Burnett of Salisbury. Chancellor of the Order of the Garter, shows his shield encircled by the Garter and imposed upon a crosier and key in saltire  the latter, no doubt, an allusion to his office of chancellor. In no other case is temporal jurisdiction united with a spiritual office in England, but in Germany and elsewhere a number of cases can be alluded to, and in such cases the naked sword is similarly disposed in saltire with a crosier, or these are placed in pale one on either side of the escutcheon. The use of the temporal sword is said to have been originated by Erlang, Bishop of Würzburg, 1106 to 1121, but its heraldic use is not nearly so ancient. The processional cross (Figure 14), which, within his province, is carried in front of (but not by) an archbishop  a privilege granted to all archbishops by Gregory IX  is also used armorially, being represented in pale behind the shield. Its use in this form by an Anglican archbishop is very rare  certainly no ancient examples exist  but elsewhere its use is practically universal. The cross of an ordinary archbishop has but a single traverse; in practice it is really a crucifix placed on the summit of a staff; but heraldry distinguishes the cross of an archbishop from the primatial cross which has the double traverse (Figure 15) and the papal cross with the treble traverse. The last named, however, is never placed behind the papal arms. Unfortuneately the bearing of the cross with the double traverse has become very far from unusual by archbishops, under the belief that the double traverse is indicative of an archbishop. The use of the pallium has received no little attention in recent years. As a vestment, its form is well known, and as a rule (to which there have been few exceptions, if any) archbishops alone have the right to wear it. It is made of fine white lamb's wool, and now has upon it six crosses pattée of black silk edged with cord. Originally the number of these crosses was indeterminate; in early examples we find two of a bright purple or, occasionally, of red, later we find four. The pallium in continental Europe has only had a limited heraldic use and that curiously disposed as an external ornament of the shield. The English method of display is nowhere else employed. In England the pallium has been the principal charge in the official archiepiscopal coats. The arms of the See of Canterbury (Plate I, Figure D) are "azure, an episcopal staff in pale or, ensigned with a cross pattée argent, surmounted of a pall of the last, edged and fringed of the second charged with four crosses pattée fitchée sable." The arms of the archiepiscopal See of Armagh are identical with those of Canterbury except that the staff is of argent ensigned with a cross pattée or. The arms of the archiepiscopal See of Dublin are the same as those of Armagh, except that the pall has five crosses pattée fitchee upon it, instead of four. Anciently the arms of the archiepiscopal See of York were the same as Canterbury, but, for some reason which is not now known, the arms of the see were changed to "gules two keys in saltire argent in chief a royal crown or". Woodward asserts that the crown was originally the papal tiara, and if this be correct one is inclined to hazard the suggestion that the emblems of the papacy were granted to York as a solatium after the long enduring contest between Canterbury and York had been decided in favour of Canterbury who was to be Primate of All England, whilst York ceded the precedence and was only Primate of England. The right to use the tiara in lieu of a mitre was granted to the Patriarchs of Lisbon by Pope Clement XII, and the change from the papal tiara to the royal crown would be a natural consequence of the Reformation. The arms granted by the papal Brief to the Archbishopric of Westminster consist of the pallium (without the cross in pale as in the Anglican shields) upon a field of gules, and the same device is used by the Archbishop of Glasgow. The emblems of the papacy consist of the tiara and the crossed keys of St. Peter "to bind and to unloose", one key being of gold and one of silver, the two being usually tied together with a cord. These are usually, and most properly, placed in saltire behind the personal arms of His Holiness (a practice originated by Adrian VI, in 1522), the shield being surmounted by the tiara, but the keys are frequently disposed in saltire below the tiara and above the shield, and, as the emblem of the papacy, the tiara and keys are often used alone without any shield at all. Crests and helmets are not usually borne by ecclesiastics. The possession of a crest is not denied to an Anglican ecclesiastic, who of course transmits it to his male descendants, but it is not correct (except in Germany) to use a crest concurrently with a mitre or ecclesiastical hat, both of which, of course, are substitutes for the helmet, to which the crest appertains. The Bishop of Durham, however, was an exception, by reason of his temporal sovereignty. In Germany, the land of many crests, it is considered quite correct to display mitre and crests simultaneously and a central helmet to carry the mitre is not unusual. The use of a motto by a bishop or other ecclesiastic is quite correct, though rather unusual in the case of an Anglican bishop. In Rome itself the use of all coronets of rank by cardinals was forbidden by a Bull of Innocent X, but elsewhere the coronet is not discarded if such an ornament appertains to the personal arms. In England the mitre would surmount the coronet with its cap, but in Continental Europe it is more general to use the circlet (Continental coronets have no cap, which is really the English parliamentary cap of dignity) disposed along the top of the escutcheon and enclosing the mitre, cross, and crosier, as may be correct. In Germany temporal lordships are often attached as endowments to ecclesiastical dignities, and in such cases the coronets of the latter are made use of. No ecclesiastic in any country by reason of ecclesiastical rank alone acquires a right to use supporters, but where a personal right to these has been inherited ecclesiastical rank or office places no prohibition whatever upon their use. There is one exception: the arms of the papacy are frequently depicted with angels as supporters, each of which holds in the exterior hand a papal cross (i.e. with three traverse bars). At the funeral ceremonies of a deceased pope, the papal arms are shown surmounted by the tiara, but the keys are omitted, these taking their place above the shield, but below the "pavilion de l'Église" of the Cardinal Camerlengo, who, whilst holding that position, surmounts his arms with the curious canopy of red and yellow which belongs to the office (Plate II, Figure E). Members of a regular order frequently impale (on the dexter side) the arms of the order with their personal arms, but how far such a practice has authoritative sanction is at least open to argument. 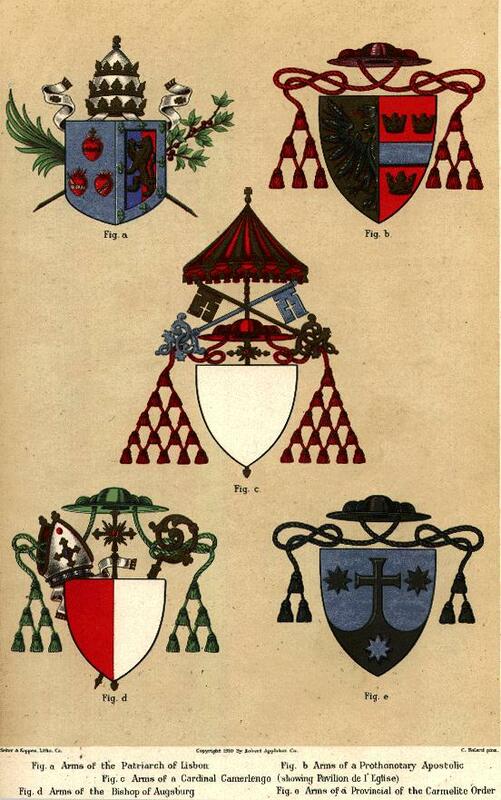 As arms of patronage, cardinals have frequently impaled with their personal arms those of the pope who has raised them to that rank, but the practice (except in the case of the majordomo of the papal household) is now falling into disuse. Precentors denote their office by placing a baton behind their shields, and the arms of a canon are often displayed upon the almuce (the tippet or hood) which forms a part of his official dress. Priors and prioresses place a bourdon (or knobbled staff) of silver in pale behind their shields. An abbess uses her arms upon a lozenge and her crosier in pale behind. Frequently the lozenge is surrounded by branches of palm, or a crown of thorns, or, more usually, by a knotted girdle of black, or black and white, silk disposed in the form of a cordelière. Armenian archbishops use a green hat with ten green tassels. Behind the shield are placed a Latin crosier and a Greek crosier in saltire, the shield is ensigned by a mitre, and in pale is a cross with a double traverse. WOODWARD, Ecclesiastical Heraldry (London, 1894); FOX-DAVIES, Art of Heraldry (London, 1904); CHEVALIER, Topo Bibl. (Montbéliard, 1894-99), s. vv. Armoiries, Blason; BATTANDIER, Ann. Pont. Cath. (Paris, 1889) 269-323; (1900), 389-393; (1902), 366-84; (1904), 127. MLA citation. Fox-Davies, Arthur Charles. "Ecclesiastical Heraldry." The Catholic Encyclopedia. Vol. 7. New York: Robert Appleton Company, 1910. <http://www.newadvent.org/cathen/07243a.htm>. Transcription. This article was transcribed for New Advent by Wm Stuart French, Jr. Dedicated to M.L.